Putting it all on the line in a desperate attempt to commandeer the rescue helicopter, Ryouta’s plan goes terribly astray. Will he and Himiko be able to salvage what’s left of it now that they have Oda on their side? With Murasaki dead, Himiko shot and Date poised to leave them all behind by escaping, Ryouta’s carefully concocted plan appears to be ending in failure. However, at the last minute Oda and Kinoshita appear to help the team, attempting to take control of the helicopter. A desperate struggle for control of the helicopter begins as the group fights for their lives. Meanwhile, while the Tyrannos Group and the creators of the Themis project watch intently to see the outcome of the game, a reporter begins to investigate the conspiracy behind the game which aims to control the internet and the world. 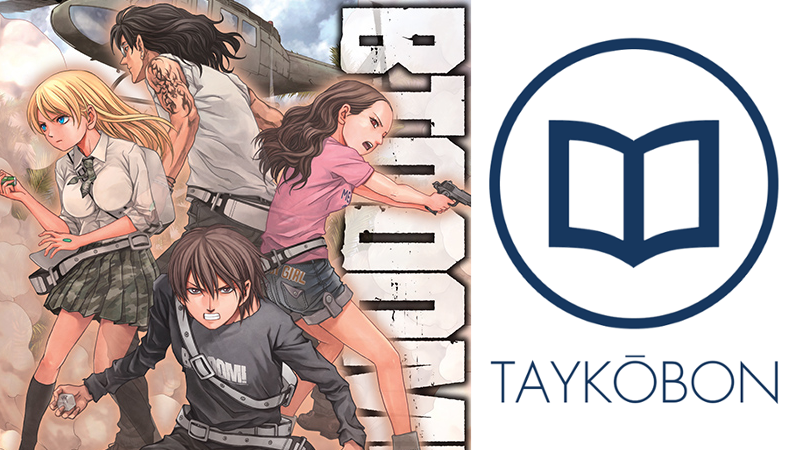 Picking up immediately after the end of the previous volume, Btooom! Vol. 12 provides an action-packed conclusion to a number of story-arcs as the group frantically attempts to escape the island. If there’s one thing to be said about this volume, it’s that the story progresses at a rapid pace, with the full-fledged battle that ensues having grave consequences for all involved. I generally enjoyed the action, and while some of it felt a little bit predictable there were numerous moments that took me off guard as the story really delivered a good deal of dramatic payoff for a number of ongoing storylines concerning these characters. It was an exciting ride all the way through, and I read the volume in one sitting and I wasn’t able to put it down because of the enjoyably frantic pacing. One thing that I’ve liked about Btooom! is that it hasn’t shied away from developing Ryouta as a character, and I always enjoy that the series takes time to show his process of internalizing everything that he’s been through. This has really cemented his character growth, and this volume is no different with a couple of powerful scenes that accomplish this. I particularly enjoyed the imagery used in a scene where Ryouta is sinking in the water and wondering if he should even go on, where we see the bodies of all the people he has killed over the series dragging him down to the bottom. This makes it even more powerful when is able to find his resolve, continuing the great contrast between his guilt at surviving versus his newfound resolve towards his friends on the island. The series has done a great job making Ryouta a relatable character, with scenes such as this doing a lot of the heavy lifting in a meaningful way. Although the scene immediately following had some jarringly awkward third-person narration which really felt odd for coming straight out of the blue, I still felt that this segment as a whole worked quite well. While the action in this volume was good thanks to its frantic and dramatic pacing, the art did not jump out at me with quite the strength I would have expected from a climactic volume. While there are numerous panels that are sufficiently detailed, it felt as though there was a distinct lack of flair or style in the compositions compared to previous volumes. Vol.10 is probably the best example of Inoue perhaps doing more with less in taking simpler scenes and making them stand out by stylizing the action in an interesting way, and although in theory there was a lot more going on in this volume action wise, it just wasn’t done in a particularly memorable way. The story ends off in an interesting way that segues into the next major storyline effectively, and I’m eager to find out what will happen next to Ryouta and his gang. However, I can’t say I’m feeling particularly optimistic about the storyline taking place off the island, as I didn’t find any of the new information about the plot to use the game to control the world particularly engaging. One of my major complaints in the previous volume was that Inoue did not give me a reason to care about what Tyrannos ambitions beyond “oh no, the bad guys want to take over the world!” and this volume hasn’t changed my mind about this. Honestly, it all feels pretty little bit silly and undercooked compared how good the rest of the story generally is. I’m hoping that the story will do more in the future to make this part of the storyline more interesting if significant time is going to be spend there in the future. Delivering a climactic finale to both the escape attempt from the island as well as a number of other ongoing storylines, this volume was a roundly enjoyable read. It wasn’t perfect by any means however, lacking the artistic flair which the series has had in the past and failing to make the storyline outside of the island particularly interesting. In spite of my complaints, fans of the series will certainly enjoy this volume and I’m excited to see where the series will go next as it heads into a fresh and different storyline. BTOOOM! Vol. 12 was published by Yen Press on November 17th, 2015. Authored by Junya Inoue, the series originally began in 2009 and is still ongoing in Shinchosha’s Comic Bunch magazine. The series received a one season anime adaption in 2012 and volume 13 will be published in English on February 23rd, 2016.